The twentieth president of the United States, James A. Garfield was born on the 19th of November 1831 in a log cabin in the little frontier town of Orange, Cuyahoga county, Ohio. His early years were spent in the performance of such labor as fell to the lot of every farmer's son in the new states, and in the acquisition of such education as could be had in the district schools held for a few weeks each winter. But life on a farm was not to his liking, and at sixteen he left home and set off to make a living in some other way. A book of stories of adventure on the sea, which he read over and over again when a boy, had filled him with a longing for a seafaring life. He decided, therefore, to become a sailor, and, in 1848, tramping across the country to Cleveland, Ohio, he sought employment from the captain of a lake schooner. But the captain drove him from the deck, and, wandering on in search of work, he fell in with a canal boatman who engaged him. During some months young Garfield served as bowsman, deck-hand and driver of a canal boat. An attack of the ague sent him home, and on recovery, having resolved to attend a high school and fit himself to become a teacher, he passed the next four years in a hard struggle with poverty and in an earnest effort to secure an education, studying for a short time in the Geauga Seminary at Chester, Ohio. He worked as a teacher, a carpenter and a farmer; studied for a time at the Western Reserve Eclectic Institute at Hiram, Ohio, which afterward became Hiram College, and finally entered Williams College. On graduation, in 1856, Garfield became professor of ancient languages and literature in the Eclectic Institute at Hiram, and within a year had risen to the presidency of the institution. Soon afterwards he entered political life. In the early days of the Republican party, when the shameful scenes of the Kansas struggle were exciting the whole country, and during the campaigns of 1857 and 1858, he became known as an effective speaker and ardent anti-slavery man. His reward for his services was election in 1859 to the Ohio Senate as the member from Portage and Summit counties. When the "cotton states" seceded, Garfield appeared as a warm supporter of vigorous measures. He was one of the six Ohio senators who voted against the proposed amendment to the Federal Constitution (Feb. 28th, 1861) forbidding any constitutional amendment which should give Congress the power to abolish or interfere with slavery in any state; he upheld the right of the government to coerce seceded states; defended the "Million War Bill" appropriating a million dollars for the states military expenses; and when the call came for 75,000 troops, he moved that Ohio furnish 20,000 soldiers and three millions of dollars as her share. He had just been admitted to the bar, but on the outbreak of war he at once offered his services to the Governor, and became lieutenant-colonel and then colonel of the 42nd Ohio Volunteers, recruited largely from among his former students. He served in Kentucky, was promoted to the rank of brigadier-general of volunteers early in 1862; took part in the second day's fighting at the battle of Shiloh, served as chief of staff under William S. Rosecrans in the Army of the Cumberland in 1863, fought at Chickamauga, and was made a major-general of volunteers for gallantry in that battle. In 1862 he was elected a member of Congress from the Ashtabula district of Ohio, and, resigning his military commission, took his seat in the House of Representatives in December 1863. In Congress he joined the radical wing of the Republican party, advocated the confiscation of Confederate property, approved and defended the Wade-Davis manifesto denouncing the tameness of Abraham Lincoln, and was soon recognized as a hard worker and ready speaker. Capacity for work brought him places on important committees -- he was chairman successively of the committee on military affairs, the committee on banking and currency, and the committee on appropriations, and his ability as a speaker enabled him to achieve distinction on the floor of the House and to rise to leadership. Between 1863 and 1873 Garfield delivered speeches of importance on "The Constitutional Amendment to abolish Slavery", "The Freedman's Bureau", "The Reconstruction of the Rebel States", "The Public Debt and Specie Payments", "Reconstruction", "The Currency", "Taxation of United States Bonds", "Enforcing the 14th Amendment", "National Aid to Education", and "the Right to Originate Revenue Bills." The year 1874 was one of disaster to the Republican party. The greenback issue, the troubles growing out of reconstruction in the South, the Credit Mobilier and the "Salary Grab", disgusted thousands of independent voters and sent a wave of Democracy over the country. Garfield himself was accused of corruption in connection with the Credit Mobilier scandal, but the charge was never proved. A Republican convention in his district demanded his resignation, and re-election seemed impossible; but he defended himself in two pamphlets, "Increase of Salaries" and "Review of the Transactions of the Credit Mobilier Company", made a village-to-village canvass, and was victorious. In 1876 Garfield for the eighth time was chosen to represent his district; and afterwards as one of the two representatives of the Republicans in the House, he was a member of the Electoral Commission which decided the dispute regarding the presidential election of 1876. When, in 1877, James G. Blaine was made a senator from Maine, the leadership of the House of Representatives passed to Garfield, and he became the Republican candidate for speaker. But the Democrats had a majority in the House, and he was defeated. 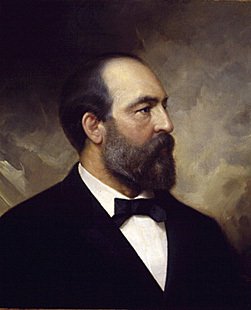 Rutherford B. Hayes, the new president, having chosen John Sherman to be his Secretary of the Treasury, an effort was made to send Garfield to the United States Senate in Sherman's place. But the President needed his services in the House, and he was not elected to the Senate until 1880. The time had now come (1880) when the Republican party must nominate a candidate for the Presidency. General Ulysses S. Grant had served two terms (1869-1877), and the unwritten law of custom condemned his being given another. But the "bosses" of the Republican party in three great States -- New York, Pennsylvania and Illinois -- were determined that he should be renominated. These men and their followers were known as the "stalwarts." Opposed to them were two other factions, one supporting James G. Blaine, of Maine, and the other John Sherman, of Ohio. When the convention met and the balloting began, the contest along these factional lines started in earnest. For twenty-eight ballots no change of any consequence was noticeable. Though votes were often cast for ten names, there were but two real candidates before the convention, Grant and Blaine. That the partisans of neither would yield in favor of the other was certain. That the choice therefore rested with the supporters of the minor candidates was manifest, and with the cry "Anything to beat Grant!" an effort was made to find some man on whom the opposition could unite. Such a man was Garfield. His long term of service in the House, his leadership of his party on its floor, his candidacy for the speakership, and his recent election to the United States Senate, marked him out as the available man. Between the casting of the first and the thirty-third ballot, Garfield, who was the leader of Sherman's adherents in the convention, had sometimes received one or two votes and at other times none. On the thirty-fourth he received seventeen, on the next fifty, and on the next almost the entire vote hitherto cast for Blaine and Sherman, and was declared nominated. During the campaign Garfield was subject to violent personal abuse; the fact that he was alleged to have received $329 from the Credit Mobilier as a dividend on stock led his opponents to raise the campaign cry of "329", and this number was placarded in the streets of the cities and printed in flaring type in partisan newspapers. The forged "Morey letter", in which he was made to appear as opposed to the exclusion of the Chinese, was widely circulated and injured his candidacy in the West. That the charges against Garfield were not generally credited, however, is shown by the fact that he received 214 electoral votes to his opponent's 155. He was inaugurated on the 4th of March 1881. Unfortunately, the new president was unequal to the task of composing the differences in his party. For his secretary of state he chose James G. Blaine, the bitterest political enemy of Senator Roscoe Conkling, the leader of the New York "stalwarts." Without consulting the New York senators, Garfield appointed William H. Robertson, another political enemy of Conkling's, to the desirable post of Collector of the Port of New York, and thereby destroyed all prospects of party harmony. On the 2nd of July, while on his way to attend the commencement exercises at Williams College, the new president was shot in a Washington railway station by a disappointed office-seeker named Charles Guiteau, whose mind had no doubt been somewhat influenced by the abuse lavished upon the President by his party opponents; and on the 19th of September 1881, he died at Elberon, New Jersey, whither he had been removed on the 6th. He was buried in Cleveland, Ohio, where in 1890 a monument was erected by popular subscription to his memory. In 1858 Garfield had married Miss Lucretia Rudolph, by whom he had seven children. His son, Harry Augustus Garfield graduated at Williams College in 1885, practiced law in Cleveland, Ohio in 1888-1903, was professor of politics at Princeton University in 1903-08, and in 1908 became president of Williams College. Another son, James Rudolph Garfield, also graduated at Williams College in 1885 and practiced law in Cleveland; he was a Republican member of the Ohio Senate in 1896-99, was commissioner of corporations, Department of Commerce and Labor, in 1903-07, attracting wide attention by his reports on certain large industrial organizations, and was Secretary of the Interior (1907-09) in the cabinet of President Theodore Roosevelt.